The Cortland 444 Clear Camo is a clear intermediate fly line with a subtle camouflage pattern along the length for reduced visibility. Great for fishing just below the surface without spooking the fish. This type of fly line is sometimes referred to as a 'slime' line. 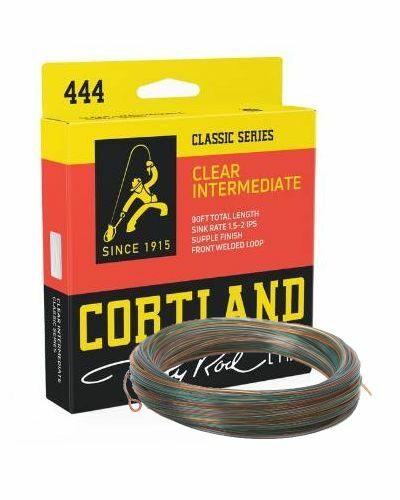 The Cortland 444 Clear Camo is a clear intermediate fly line with a subtle camouflage pattern along the length for reduced visibility and is great for fishing just below the surface without spooking the fish. Available in WF profile in sizes #5 - #8. It's often said that the colour of the fly line makes no difference to the fish. Don't you believe it. I've seen too many fish stop and swim away from brightly coloured lines to find this theory believable. To get the best results a low visibility fly line such as the Cortland Clear Camo can be a great help. Best slime line on the market. Casts great & looks the part !